Lavender - oil against insect bites (summer eczema), nervousness and calming coughs and can also be used in case of injuries. A few drops mixed with jojoba - oil on eczema or mixed with green clay for injuries in general. As steam for cough, 5 drops in a bucket, then pour hot water over it and let the horse inhale. be careful that he does not burn the nose. 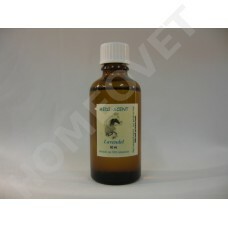 to 3-5 drops mixed with jojoba - oil on the forehead or rub the Nostrils and distribute a few drops in the barn. Our Lavender - oil is to use even as a gargle for sore throats, to 4 - 5 drops in a glass of water and rinse. For headaches massage directly to the forehead. Attach with insomnia a few drops on the pillow. To relax, give 10 drops in the bath water.